Schiedam (near Rotterdam), Netherlands. Laid down by Wilton-Fijenoord shipyard for the Royal Netherlands Navy (RNN). Completed. GEMMA is to serve in the Dutch East Indies (DEI) as a patrol vessel. Following the mobilization in the Netherlands, Governor-General Alidius W. L. Tjarda van Starkenborgh-Stachouwer decides to militarize the GM and it becomes a part of the Royal Netherlands Navy. The patrol boats are put under the RNN's East Indies Squadron. The GM ships' new status is activated. This does not mean every GM ship is now under military orders, but GEMMA is one that is; she becomes Hr.Ms. GEMMA. The CO GM is notified that GEMMA, VALK, FAZANT, AREND, MEREL, BELLATRIX, CASTOR, SIRIUS, REIGER, ZUIDERKRUIS, RIGEL and TYDEMAN are the only GM ships to receive orders from military authorities. 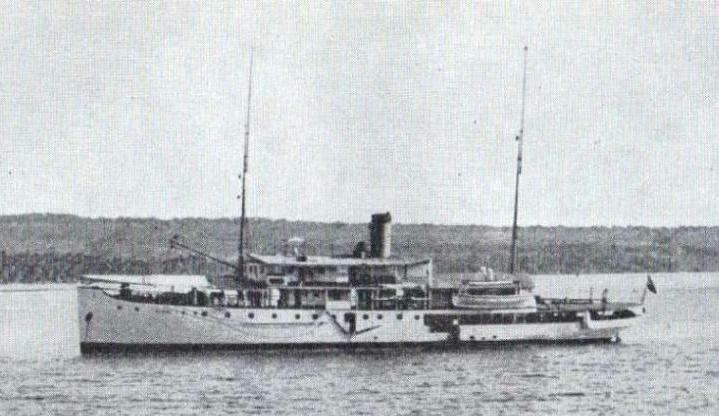 Scuttled by her crew in Surabaya, Java to prevent falling into Japanese hands. Maintenance directive is issued under Navy’s secret instruction No. 227. Emergency repairs are completed by the 102nd Naval Construction Unit. At 0830 arrives at Kota Baru, Borneo. At 0700 due to depart Sourabaya. Due to arrive at Kota Baru, Borneo. At 1200, departs Surabaya in convoy also consisting of fleet oiler TSURUMI and auxiliary oiler KYOEI MARU escorted by minesweeper W-12 and auxiliary subchaser CHa-103. At 1600, detached from the convoy. Currently assigned to Vice Admiral (later Admiral) Takasu Shiro’s (35) Southwest Area Fleet in Vice Admiral Mikawa Junichi’s (38) 2nd Southern Expeditionary Fleet, 22nd Special Base Force. Departs Surabaya later that day in a convoy also consisting of IJN shared tanker (B/C-AO) JANBI (JAMBI) MARU and auxiliary oiler ENOSHIMA MARU escorted by minesweeper W-12. Arrives at Kota Baru, Borneo. Departs Surabaya and arrives at Kota Baru. Engages in rescue mission of an unidentified ship in distress at 04-10S, 118-05E. Enters Surabaya drydock for maintenance and repairs. At 0852, departs Surabaya in convoy SUBA-02 also consisting of IJA transport KENZAN MARU, civilian cargo ship (C-AK) TOKUSHIMA MARU and civilian tankers (C-AO) NANSHIN MARUs No. 12 and No. 16 escorted by minesweepers W-11 and W-103, subchaser CH-2 and auxiliary subchaser CHa-36. At 0947, W-11 and subchaser CH-2 are ordered to join another convoy consisting of tug AKITSU MARU and gunboat NANKAI and are detached. KITA MARU is later also detached and arrives at Sebuku Island. Departs later. End of hostilities. Survives the war. Removed from the IJN Navy’s list under instruction No. 327-2. GM ss (Gouvernements stoomschip). The Dutch civil navy, tasked with transport of government goods, charting sealanes and countering piracy, was militarized in 1939. It became a part of the RNN as the GGM (Gemilitairiseerde Gouvernementsmarine - Militarised Government Navy Force). HOKKAI MARU struck a mine on 23 Sep ‘44.